Drama unfolds leading what could be considered as an embarrassing scene, a man and a women were spotted fighting outside a Shoprite Mall at an undisclosed location. According to trending online reports, NewzEMPIRE discovered that the yet-to-be identified man allegedly slapped the lady who purportedly insulted him following an issue between them. 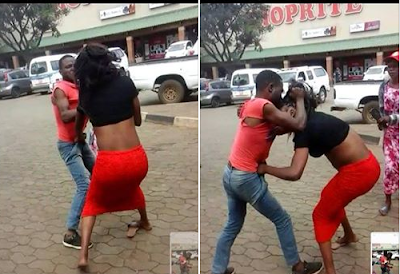 The lady then, attacked the man right there in front of the supermarket as two of them fought brutally to the shock of onlookers.